Exterior of the Merritt Canteen in Bridgeport. The vintage eatery began as a roadside “shack” in 1942 near the Merritt Parkway, hence its name. If the Merritt Canteen looks vintage to you, it is. It started as a humble roadside “shack” in 1942. Situated close to the Merritt Parkway (hence the name), it was a destination to grab a good hot dog or a hamburger. Even the word “Canteen” seems odd in the modern parlance of our time. Yes, a canteen means a flask to hold water while hiking, but around World War II it often referred to a restaurant frequented by soldiers, college students or factory workers. It was a reliable and quick place to eat, nothing fancy or expensive. Although the Merritt Canteen has changed hands over the years, the spirit has remained the same. Being neither a diner nor a drive-in, it is a nostalgic hangout like the local malt shop once was — a G-rated, clean, well-lit place. 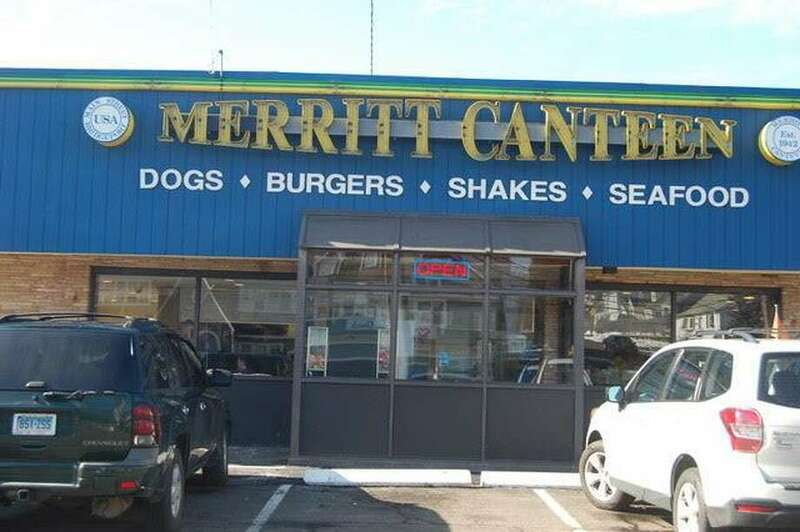 If the Merritt Canteen is legendary (which it is) and has an army of fans, its celebrity rests on its chili dogs. More specifically on the chili that tops the dog. Exactly why this chili is so much better then any other chili is a mystery. I have eaten chili all over the place and even wrote a best-selling cookbook, “Chili Nation.” I am familiar with pretty much every style of chili, from beanless Texas Red to the Macedonian-spiced Cincinnati chili. I am pretty good at deconstructing a chili and figuring out what went into it. But the chili at the Merritt remains a tantalizing mystery. The chili at the Merritt Canteen is hot, soupy, red and has meat in it. Beyond that I have no idea why it tastes so singular. The hot dog and the bun under it also look rather plebeian, but one bite is enough to convince diners there is something different and very special here. The chili works on everything; ask for it on your hamburger, french fries or even just get a bowl of it plain by itself. The only thing I like to add is some chopped onion, which brings it up a notch. Like an opioid, the chili has a strange effect on me. I think I have been satiated, but after a day or two I begin to crave it again; a week later it becomes an obsession. I need an intervention. This time when I visited, I tried to broaden my menu selection. I ordered fried shrimp (OK), a chocolate shake (also OK), a lamb burger with feta cheese and tatziki sauce (very good) and a heap of french fries (fine). I tried the fried clams (meh), an Angus burger (delicious) and unearthed the hidden gem of the menu: fried onion rings, which were perfectly cooked and seasoned. I would go out of my way to eat these. Onion rings with chili? Why not? Good onion rings are not easy to find in Fairfield County; many are “pre-fab,” breaded and dumped out of a freezer bag. Not here. The other hidden gem perfect alongside the chili dog is Del’s frozen cherry lemonade: refreshing and unique. For dessert, I ordered deep-fried Oreos because they sounded strange. They looked like doughnut holes with a melted chocolate center. I saw no resemblance to an Oreo at all and was not impressed. Maybe if they had chili on them? One of the delightful things about the Merritt Canteen is the staff. As you can see, I ordered quite a bit of food. I am used to being stared at in restaurants when my table looks like it feeds eight and it is just me sitting there. I have been asked a few times if I have an eating disorder. At the Canteen, you step up to the order window and tell the person there what you want to eat. I reeled off my whole order, then I added a few other things, then I canceled something. The young woman behind the counter wrote nothing down nor pushed a computer button. She kept it all in her memory and repeated it verbatim to the cook. I am at the stage of life where I walk into a room and forget what I went in there for. If there was still a Ripley’s Believe It or Not! newspaper column (same vintage as the Merritt Canteen), the order-window lady deserves an inclusion. The other great thing about the Merritt Canteen is that it stays open until 1a.m. As great as it is to eat here in broad daylight with your little kids, there is something extra cool about being there at 1a.m. Think about who needs a chili dog at 1a.m. and you can see why this place has its own cool cult following. With other “old-fashioned” hot dog and hamburger places dropping off the map (I am still in mourning for Swanky Franks), it is a pleasure to see what brisk business the Canteen is doing. It is an old reliable and never fails to deliver on its promise. Keep up the good work.